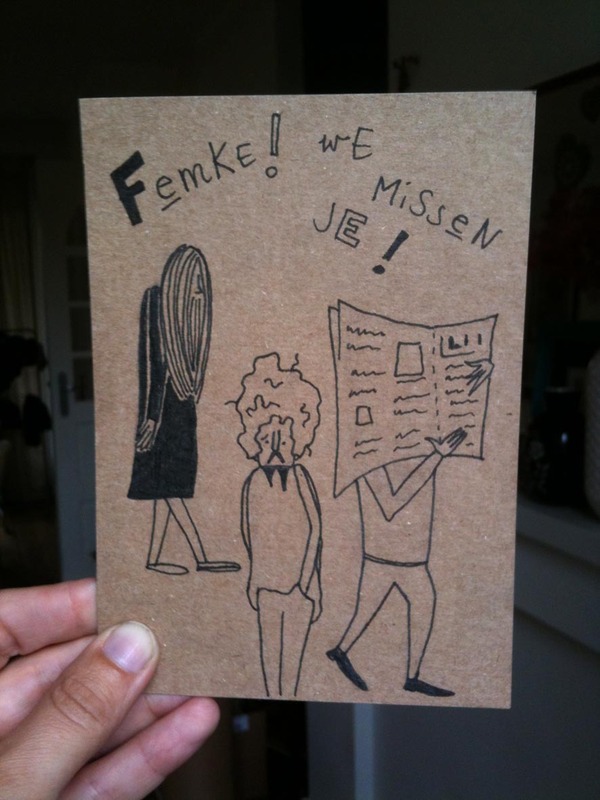 A quick get-well-soon-card for my favorite hairdresser. What are we without our hair artists?! And on my way to delivery I discovered this sweet question on the side of a building. 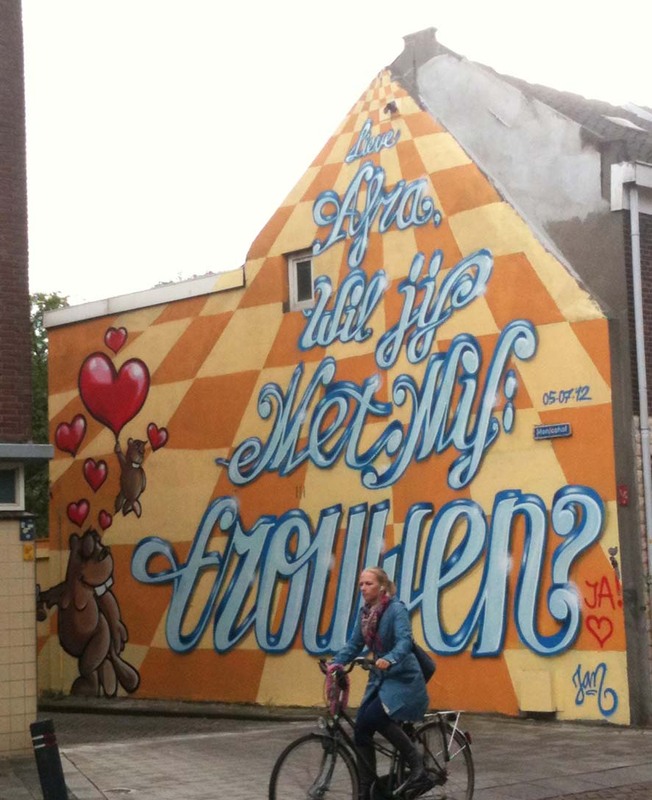 One of Utrecht’s most famous graffiti artists, Jan is de Man, asking his girlfriend to marry him. To paint a whole house for the one you love…! A shout out for holidays*! I am so sorry for being so quiet these days, peeps. Nonono, I am actually working my bloody behind of to get ready for the Woonbeurs! The Woonbeurs is the largest interior design fair in the Netherlands. Attentive readers will know that I am opening up a shop! Now that I wrapped up the process of writing a businessplan, making up moodboards and having delicious lunches with inspirators, it is time to get things going! At this moment all the focus will be on finding a good space. For the time being you can check out the one page website just to give you a sneak peek of the feel of the concept and to give you the opportunity to subscribe to the newsletter, so you’ll be the first to hear when Urlaub will open! Another sneak peek will be carried out at the Woonbeurs. Not only will Urlaub be selling lots of products (hence the hard labour! ), you will also find me and some fun colleagues in live action: screenprinting and teaching cool workshops. To me the core of being on holiday is enjoying little things everyday, feeling excited, being open to new experiences. This is exactly the kind of spirit I encounter in being an illustrator and in working together with other creatives. And, this is also the feeling I want to transfer to all of you, the Urlaub customers! Check the website here. Via the website you can subscribe to our newsletter. Urlaub will inform you about our search for a space and the eventual opening. Fingers crossed for a permanent offline residence! You can also check Urlaub out on Twitter and Facebook. Or, just come to The Woonbeurs! https://www.ellenvesters.com/wp-content/uploads/logo-ballon_urlaub-roze_kleiner-site1.gif 0 0 Ellen https://www.ellenvesters.com/wp-content/uploads/logo-ballon_urlaub-roze_kleiner-site1.gif Ellen2012-09-13 22:09:192013-01-10 22:37:08A shout out for holidays*!